In the Marshall Islands, navigation was, and remains, a crucial skill on which the lives of the navigators and all who sailed with them depended. In the past, knowledge of the art of navigation was a closely guarded secret, handed down within certain chiefly families. To assist in recalling and imparting aspects of navigational knowledge, navigators constructed diagrams representing different portions of the archipelago. Typically made from the stick-like midribs of coconut palm fronds, these objects were memory aids, created for personal use or to instruct novices, and the exact significance of each was known only to its maker. The charts were exclusively used on land, prior to a voyage. To carry one at sea would put a navigator’s skill in question. The charts indicate the positions of islands, but they primarily record features of the sea. 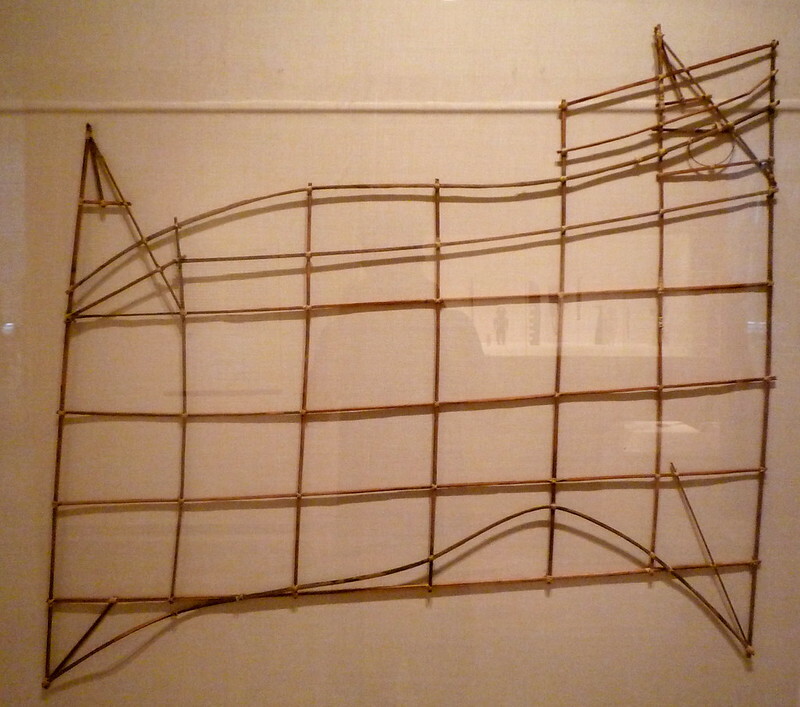 Marshallese navigation was based largely on the detection and interpretation of the patterns of ocean swells. Much as a stone thrown into a pond produces ripples, islands alter the orientation of the waves that strike them, creating characteristic swell patterns that can be detected and used to guide a vessel to land. It is the pressence and intersection of swells and other marine phenomena, such as currents, that are primarily indicated on the charts. Image published by jasoneppink on 2009-08-30 16:04:14 and used under Creative Commons license. Tagged: , Met , Metropolitan Museum of Art , navigational chart , navigation , map , mystery! , secret!